MM Note: House Hacking is blowing up right now. We’ve written about house hacking before, but I asked one of the homies Jacob Perez, a Canadian house hacking master, to break down the basics so you could learn and share them with your friends. Jacob is killing it, he’s house hacked his way to owning 6 and a multi-million dollar portfolio and he’s still in his 20’s. This really works. In this post, I will break down a lifestyle trend that’s booming in popularity amongst younger investors. 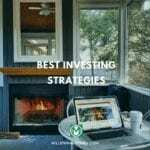 Real Estate investing is always a hot topic, how can it not be. Homes are often the biggest financial asset individuals hold in their lifetime. In addition, houses, whether we buy them, or rent them, satisfy the basic human need for shelter. This article will examine a lifestyle trend born out of financial need, that has shifted Millennials’ mentalities towards the real estate market. We’ve gone from complaining about real estate prices to capitalizing on opportunities and choosing to build portfolios of property from a young age vs. saving for our forever home. Forget rent vs. buy, buying real estate can be the best investment decision you’ll ever make. This trend is known as House Hacking. House Hacking is having your cake, and eating it too. It’s a mix between buying a personal residence and an investment property. Simply put, House Hacking is buying a multi-unit property, and living in one unit, while renting the other(s) for supplementary income. Now I’m one of the lucky ones, I have a roof over my head provided by my parents, which has allowed me to save a lot and invest directly into rental properties without thinking about where I have to live. So, in reality, I take house hacking one step further by living free. Six properties later, a multi-million-dollar portfolio, and several tangible case studies of success to sell to investors if you want or need investors later to build an even larger real estate profile, I would say the small lifestyle sacrifice of being in my parent’s basement has been worth it. The case studies of success are the most valuable piece of the pie because they can be used to raise more money. Many of us are not escalating in our careers financially at the same pace the real estate market has accelerated. Houses are now viewed as an asset, business, & retirement plan. Enter House Hacking. House Hacking will allow you to pay LESS month-to-month, even while buying a SIGNIFICANTLY more expensive house. 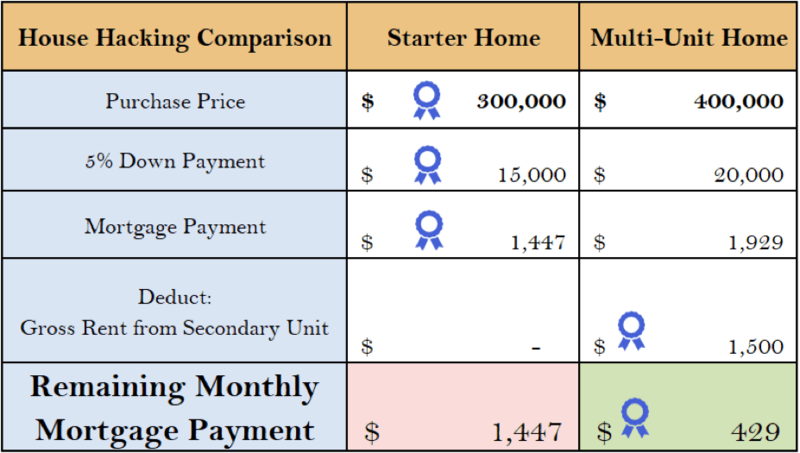 The following is a cost breakdown of buying a starter home for $300,000 vs a Multi-Unit Home for $400,000 as it relates to mortgage payments. Disclaimer: These figures may not represent your exact market, however, it’s food for thought, and is a real example directly from a market in Ontario. In this scenario – Purchasing a home worth $100,000 MORE can potentially SAVE you $1,000 per month in costs. Think about that. You pay $5,000 more in down payment up front, to save over $12,000 in year one. You get your money back in 6 months. You also now own a more valuable property. Later in the article, I’ll break down the other profit centers found within house-hacking. In addition to monthly savings – the versatility of house-hacking is a big reason for its popularity. Your 20s & 30s bring significant changes in your life. If you’re like me, you probably have commitment issues. This is why I haven’t left my parents house. Committing to a home long term is tough for me. On the other hand, I have no problem committing to something long-term if it pays me every month, which is what makes house hacking and investment properties so attractive. House Hacking provides the flexibility needed to create a living experience that suits your life as you evolve. Want to save the most money possible? Live in the least desirable unit in your home, in the basement or even on the couch if you roommates are down with it. Feel like you deserve the nicer suite? Upgrade yourself and rent out the less desirable unit. Want a new place and maximum money saved? Rent your less desirable unit, and get a roommate for your unit. What if you’re only comfortable with exclusive access to the backyard and driveway parking? You’re the landlord, specify the use of common spaces in your tenant’s lease. Received a Job offer out of town, what now? Rent your unit out, move, and use the cash flow towards your rent elsewhere while you figure out your next move. You love the neighborhood and don’t want to move, but your family has grown….Convert multi-unit to a single family residence and stay in the neighborhood you’ve grown to love. The point is house hacking is extremely versatile, & won’t leave you stuck in one place facing a mountain of debt. 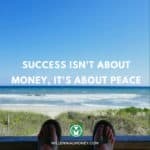 It’s a no-brainer in absolutely every sense for people beginning to build wealth. This benefit could really be its own post, I’ll try to keep it concise. House hacking will get you to your second home faster while allowing you to hold on to your first. We now know that house-hacking decreases your month-to-month costs significantly. The result is you’re able to save more money faster, to allocate towards your next purchase (don’t stop at one property). In fact, house hacking can be the perfect side hustle. While your personal month-to-month costs are lower, your mortgage payment itself is still higher. As a result, you’re paying more principal towards your mortgage by choosing a more expensive property. Using the scenario built out earlier, even though we pay $1000 less per month, we’re still paying just over $200 more principal per month. The result is an additional $12,000 in equity paid down after 5 years (all while saving more month-to-month). More savings to go with your savings. I’ll make this simple – If your $300,000 starter home and $400,000 duplex both appreciate by 6%, which makes a greater return? Of course, the $400,000 asset. When you factor this is compounded year over year, the difference gets a lot larger. If you purchase the correct property, you’ll be able to receive cash flow a healthy amount above your monthly expenses with all units rented. Having a healthy cash-flow will allow you to refinance equity out of your existing home, and leverage that cash to place a down payment on your second property. 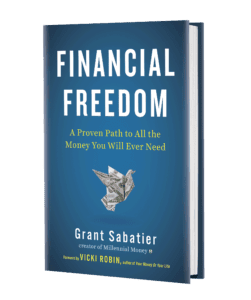 If you make enough cash flow above your expenses you’ll still be able to break even, or produce cash month-to-month on your first property with an increased mortgage payment from your refinance. Building a portfolio of property as you upgrade from home to home will act as the building blocks towards your retirement, children’s future, or whatever projects are more in line with your goals. Your month-to-month costs are determined by the type of home you buy, as much as the purchase price. House hacking is done by design, can suit any lifestyle, and will keep you flexible enough to pursue the many opportunities that will come your way in life. House hacking allows you to save money now by paying less out of pocket month-to-month. In addition, you’ll pay down more principal in the process, and benefit more from appreciation. House hacking allows you to enter the market with confidence, and build a sustainable portfolio of property as you periodically upgrade from home to home. The whole idea here is leveraging real estate. So, whether you’re house-hacking it, or living at home with your parents like me, this is a no-brainer. You can leverage the wealth made through real estate for so many things, help start a business, build a brand, pay for a wedding, travel, whatever you want. What’s better than that? Jacob Perez a Mortgage Agent by trade, has been investing aggressively in the Canadian Real Estate market since he was 23 years old. After some early success, Jacob began raising capital & leveraging joint-venture money partners to grow his real estate portfolio. Love this strategy, if you want to double down and love passive cash flow look into buying mortgage notes, you essentially become the bank. I diversified into these 6 years ago and now own 100+ mortgages. Most people don’t know you can buy these but you can. Awesome side hustle. 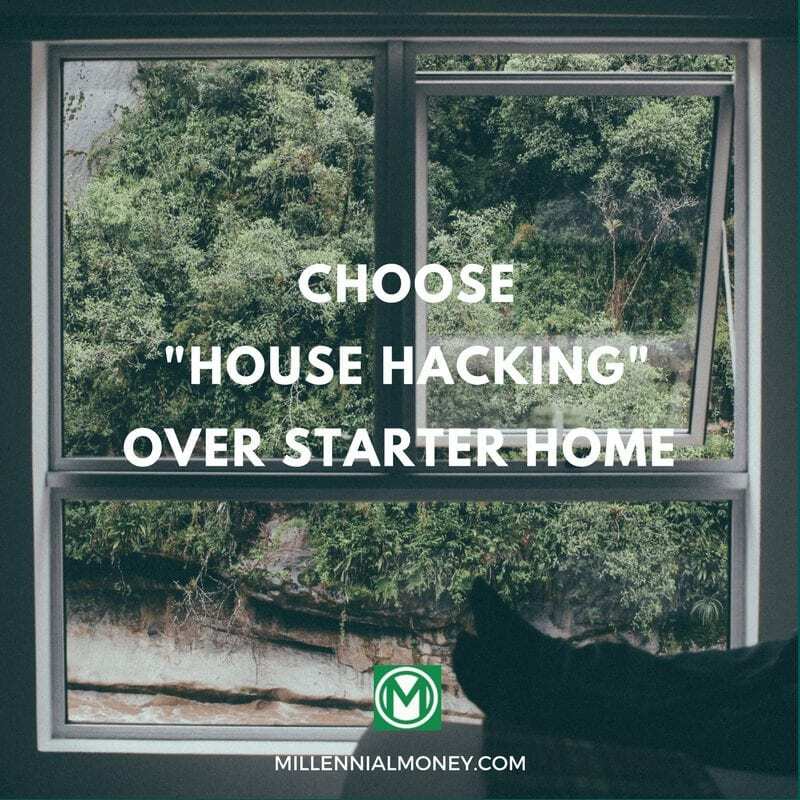 House hacking was the strategy that helped me quit corporate America at the age of 24 and transition in to my real estate career. Buying a home at the age of 23 and house hacking for the past 5 years helped me build a portfolio of 12 doors. It’s freaking awesome. I highly recommend this strategy to millenials. This was a good and interesting post. I especially liked seeing the numbers. You can really save a ton with having income properties. Thank you for sharing!